We didn’t want to go out to eat on a workday, but we did have one of our best friends coming over for dinner. Being a best friend, he would have been happy with grilled cheese. But being his best friend, I wanted to feed his tummy as well as his soul. Life can be tough sometimes, as it’s often playing games to keep you on your toes. It goes without saying that if the changes are in your court, it’s much easier to be slight-of-foot. But as we all know, life, for some gosh-darned reason, just doesn’t always want to play nice. So if you find yourself with unsure footing, I’d at least like to help by keeping you fed. Enter this homey, delicious, budget friendly supper: my Make-Ahead Chicken Tagine with sweet potatoes, garlic, tomatoes, and spices. You can make this stellar Chicken Tagine supper a few days ahead of time and store the entire dish in the fridge (just keep everything in the pot). When your best friend walks in your door, carefully take the sweet potatoes and chicken out of the pot and warm them up in a covered pyrex in the oven. Reduce the sauce as you are making a grain side-dish, and you’re set. It’s really so easy. Plus, the sauce is great days later (I recommend making extra!) over whole-wheat pasta. Heat the olive oil in a large dutch oven over medium heat. Add the diced onion, season with salt and pepper, and cook until soft (7 minutes). Add the chicken to the pot and sear each side. Season again with salt and pepper. Once the chicken is lightly seared, add the white wine, chicken broth, adobo sauce, ground ginger, and spices. Place the sweet potatoes on top of the chicken mixture. Add the diced tomatoes. Finally, top the entire mixture with the minced garlic. Season once more with salt and pepper. Simmer for 50 minutes on medium to medium-low. 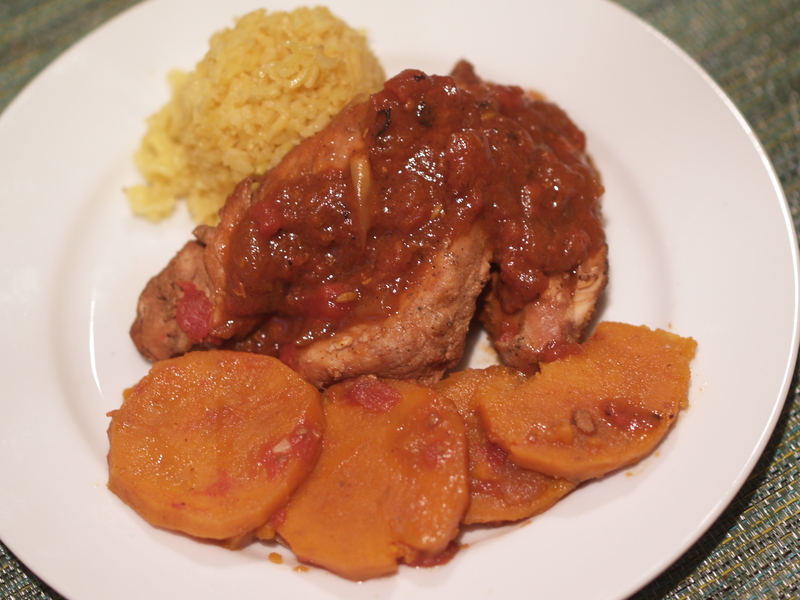 If serving immediately, remove chicken and sweet potatoes and reduce sauce (see below). If making ahead, allow to cool and place in fridge. Please note that you’ll need to reheat the chicken and potatoes in the oven (keep them covered so they don’t dry out) while you reduce the sauce. To reduce the sauce: Add slivered ginger and additional spices to taste. Heat the sauce to a boil, then simmer until it thickens. Remove bay leaf and slivered ginger; serve over the chicken and potatoes. Make it a complete meal with curried balsamic rice! This entry was posted in Budget-Friendly, Chicken, Dinner, Do Ahead, Sweet Potato and tagged Dinner, easy, Make Ahead, Tagine, Tomatoes, Vegetables. Bookmark the permalink.